Ages 4 through 11. 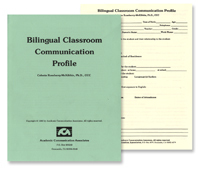 This instrument is an assessment questionnaire that can be used to help educational professionals distinguish communicative differences from communicative disorders. The classroom teacher completes the questionnaire. Both the structural and functional aspects of communication are examined. The kit includes the administration booklet and 30 copies of the questionnaire.